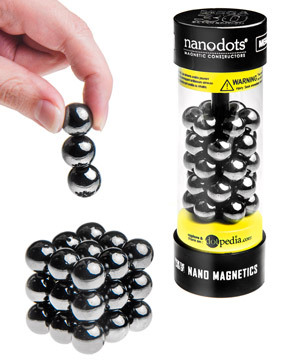 Mega NanoDots: Magnetic marbles for building and playing. You can devote time to crafting a complex sculpture, or simply distract yourself with the interesting interplay between the magnetic balls. 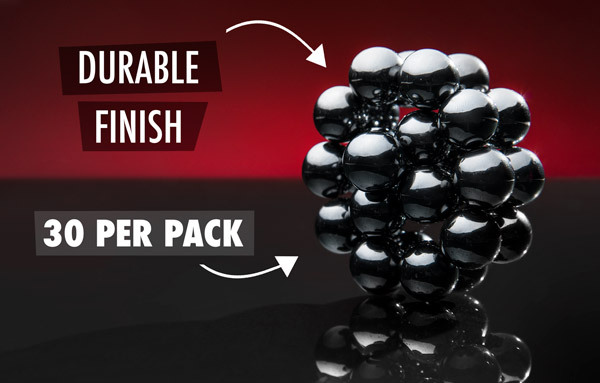 Each pack of 30 NanoDots contains an infinite number of ways to defeat boredom. Please note: We cannot ship this item outside the U.S. 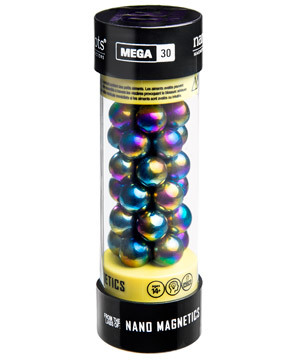 The shape and strength of Mega NanoDots let you manipulate them in unexpected and entertaining ways. You can spin them like a top, set up chain reactions, or watch separate groupings instantaneously converge into single shapes. 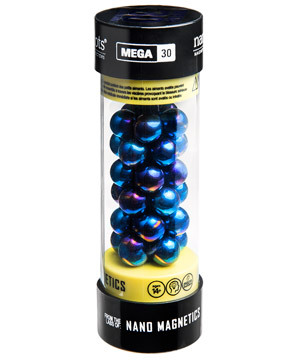 Come up with your own magnetic tricks, and have fun exploring what’s possible with this scientific toy. Create your own magnetic magic. Although interesting enough to absorb your complete attention, Mega NanoDots are also a great mindless distraction for your hands. 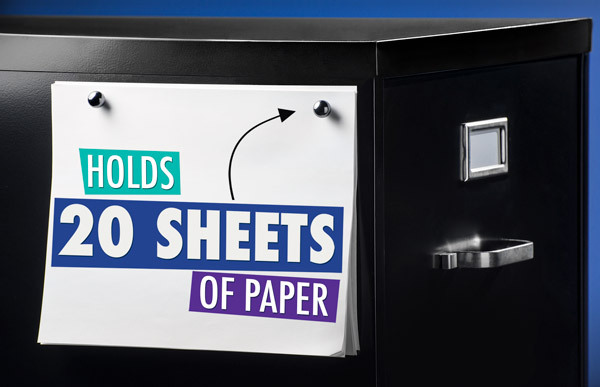 Keep a set at work so you have something to fidget with as your brain solves the problems that make up your workday. 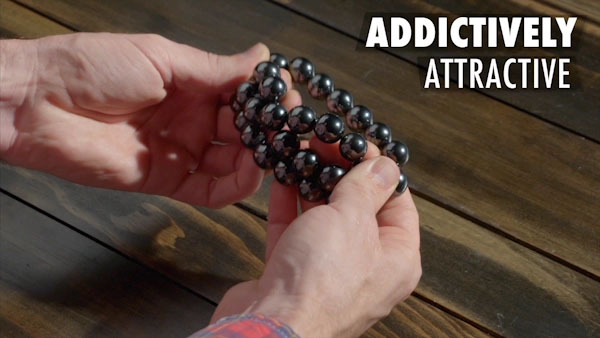 When you need a break from your job, devote your attention to doing some more serious playing with these addictive toys. ‘Cause your fingers need fun too. Mega NanoDots pack a lot of attraction into each orb. The high-grade magnets are strong enough to dangle as a long string or to pick up other metallic objects. It also means that these constructors will stick together for building and manipulate other orbs for playing. They use their strength for playing. Part of the fun of Mega NanoDots is watching them move over surfaces, sometimes banging together as you attempt new tricks. That’s why the magnets are made with military grade ceramic ferrite and plated with several layers of metallic surface. All that protection helps prevent wear and keeps your Mega NanoDots intact through intense fidgeting. They can withstand your playtime. 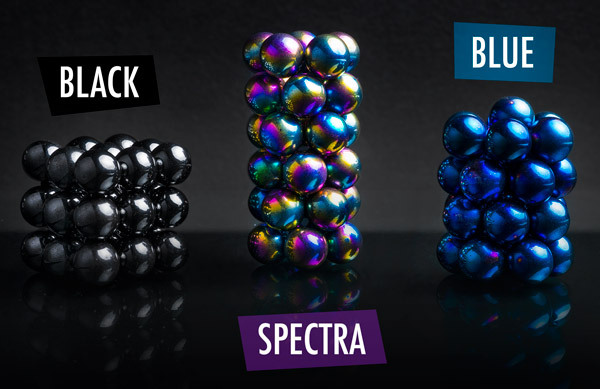 Mega NanoDots are available in three different finishes: black, spectra, and blue. Grab all three so you can build multi-colored formations on your desktop. Mega NanoDots are housed in an innovative spool canister that includes instructions to get you started and pictures of geometric shapes to build. You’ll be able to start playing right away! Three styles for you to admire. 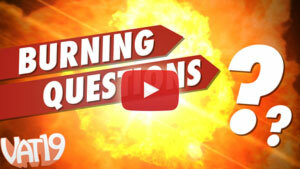 Answer: Mega NanoDots, like any small magnet, are only dangerous if swallowed. They should absolutely be kept away from small children and never put in anyone’s mouth. For that reason, the recommended age is 14 and up. Answer: Mega NanoDots are three times bigger than NanoDots and 6.5 times bigger than MicroMagnets. Mega NanoDots don’t have the same flexibility for building as the other two orbs, but their larger size makes them better for playing.